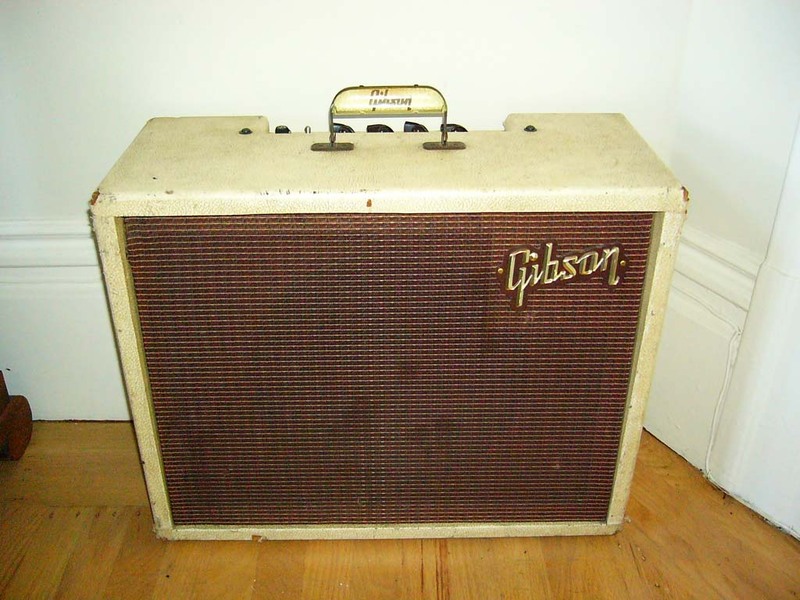 Very fine practice, small venue, or recording amp. 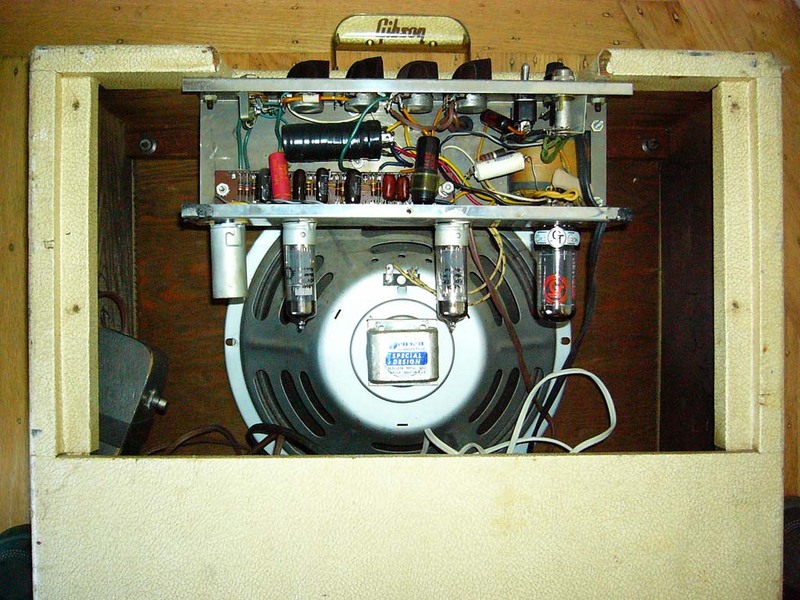 Unless you have and want a museum piece, it will need new / increased power supply caps and resistors, fresh cathode bypass caps, and a new volume pot. If you like the sound clean and round, change coupling caps to .1s, .05s for edgier, 'twangy' sound. Breaks up easily, adaptable, simple to work on. 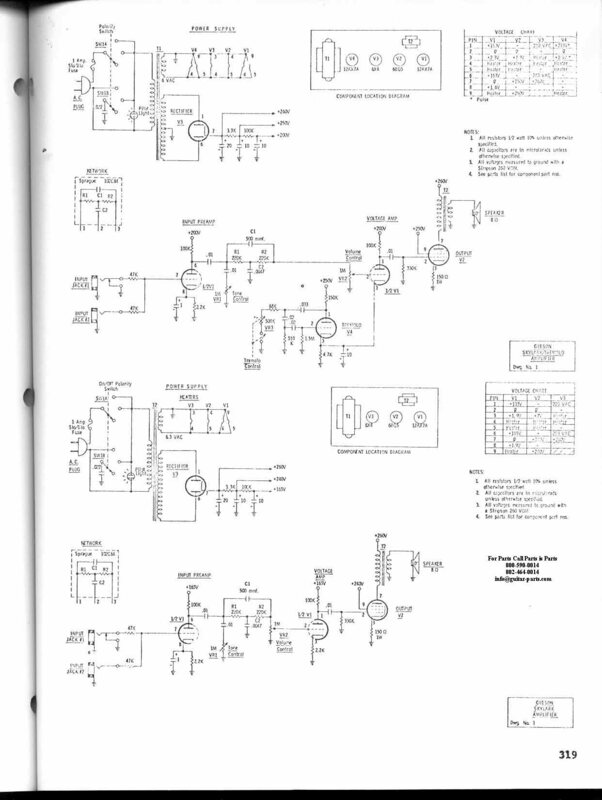 Single-ended / Class A circuit; 12AX7 pre-amp, 6BM8 output with the front triode section operating the Tremolo function, and a 5Y3 rectifier. 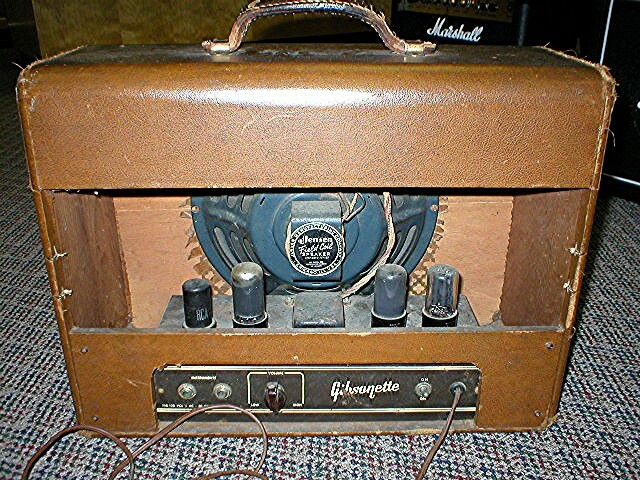 This model was originally fitted with a foot-switched reverb tank to be fed in a very awkward way from an independent separate amp where this amp was to 'echo' the original signal. 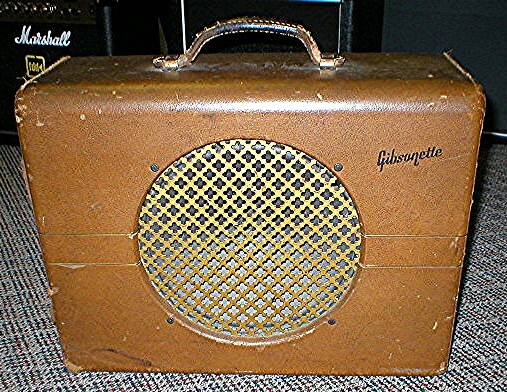 This model was later upgraded to the GA1RVT with an additional tube / transformer to operate the reverb. 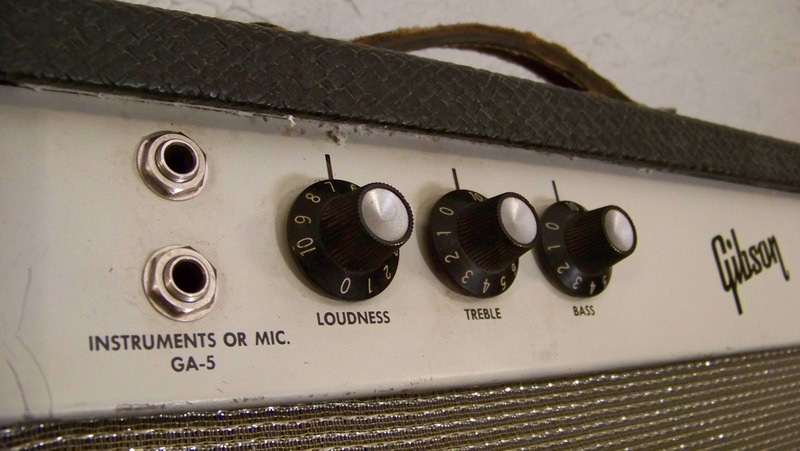 Tone Controls on Each Channel: No? 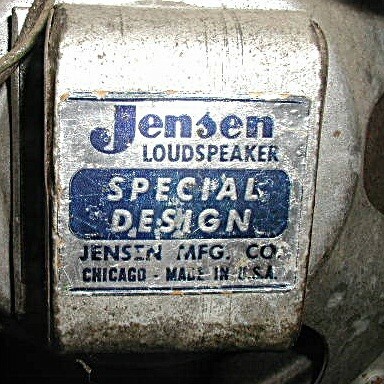 Speakers: oval 5"x7" or 1x10" Jensen? 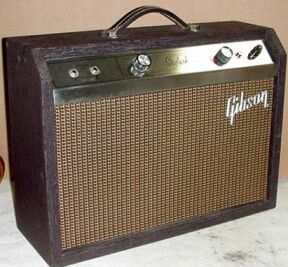 This (see first pic) is a beautiful example of the earliest style GA-5, made in 1954-56 these first three years the GA-5 model designation was 'Les Paul Junior'. The Skylark name came in 1957. 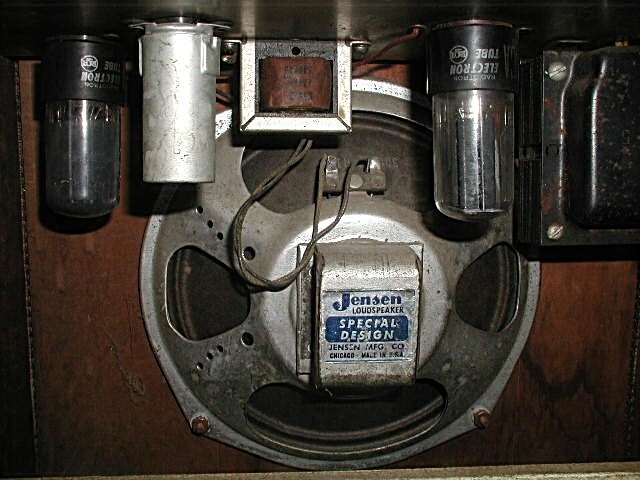 Note the 'TV' front panel. 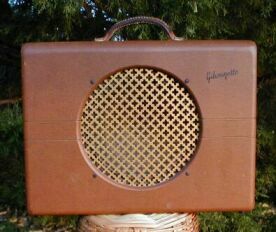 This model had a 10" Jensen speaker and a tube compliment of 1x6SJ7 (pre amp) 1x6V6 (power amp) 1x5Y3 (rectifier). 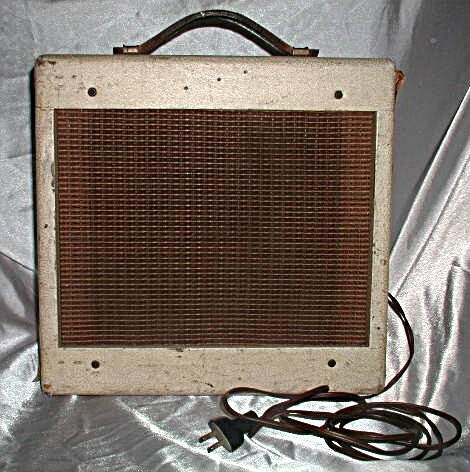 The circuit in these is very nearly the same as the Fender 5C1 model 'Champ'. 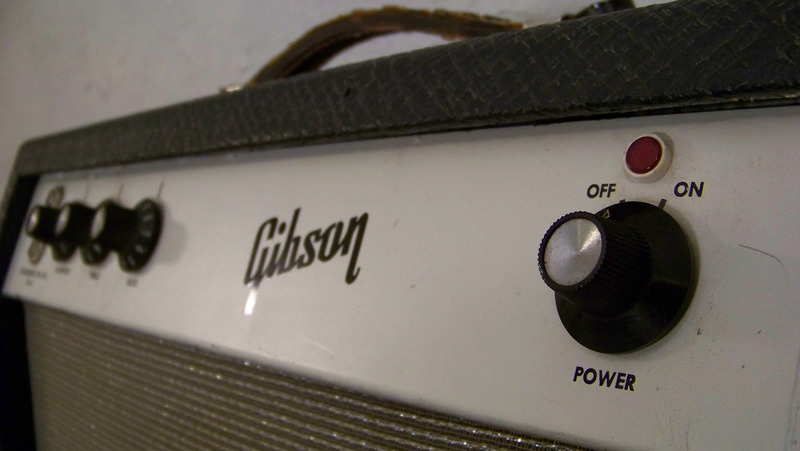 The ideal student amplifier - yet powerful enough for professional use. Lightweight, easy to handle, with easily accessible top-mounted control panel. 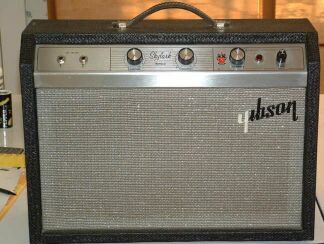 Amazing quality and fine tone reproduction. Features: Attractive gold covering, new slant grill, 3/4" solid wood lock-joint construction. 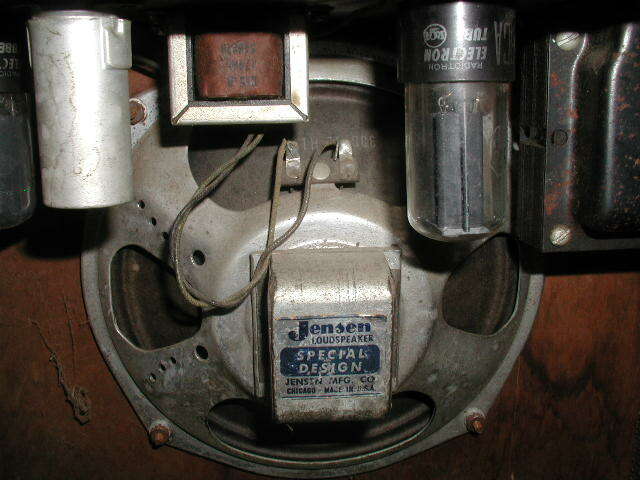 Top mounted, nickel-plated chassis. 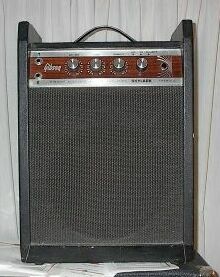 Quality 8" speaker, 4 1/2 watts output . . . three tubes. 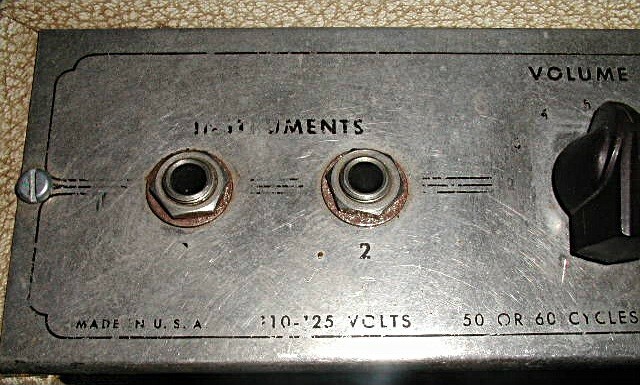 Two instrument inputs. Beginning in 1957 until 1961 the first true 'Skylark' model was introduced. 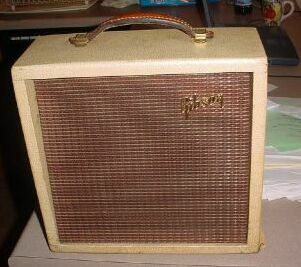 Note the blond tolex and the disappearance of the 'TV' styling (see first pic). 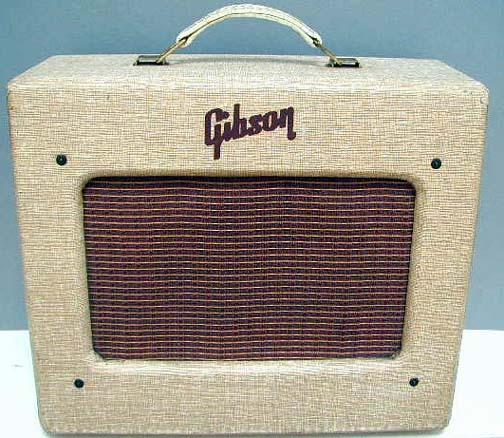 Some Gibson models sported a 'tweed' looking vinyl covering in 1960-61, but not the Skylark. 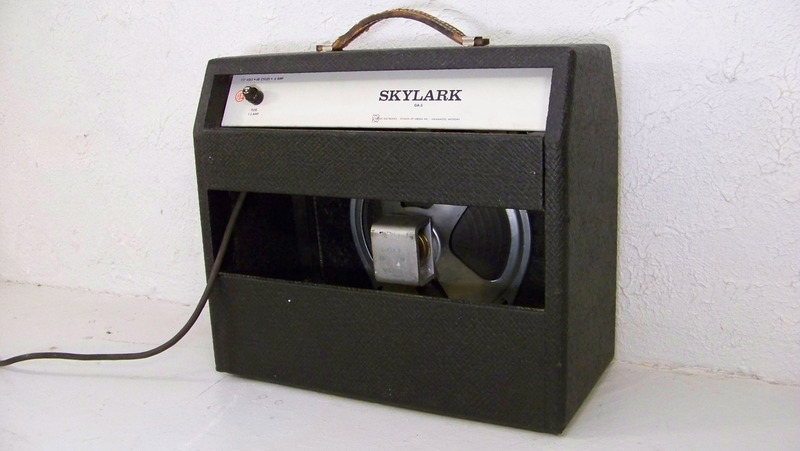 Beginning in 1957 until 1961 the first true 'Skylark' model was introduced. 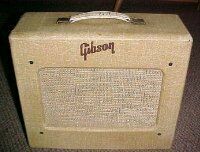 Note the blond tolex and the disappearance of the 'TV' styling (see pic). 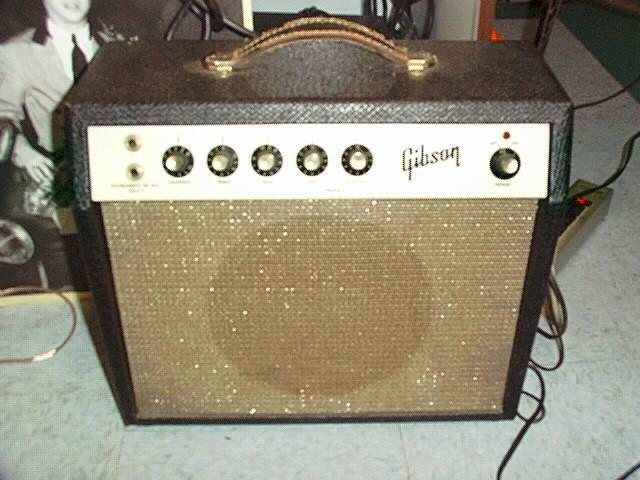 Some Gibson models sported a 'tweed' looking vinyl covering in 1960-61, but not the Skylark. 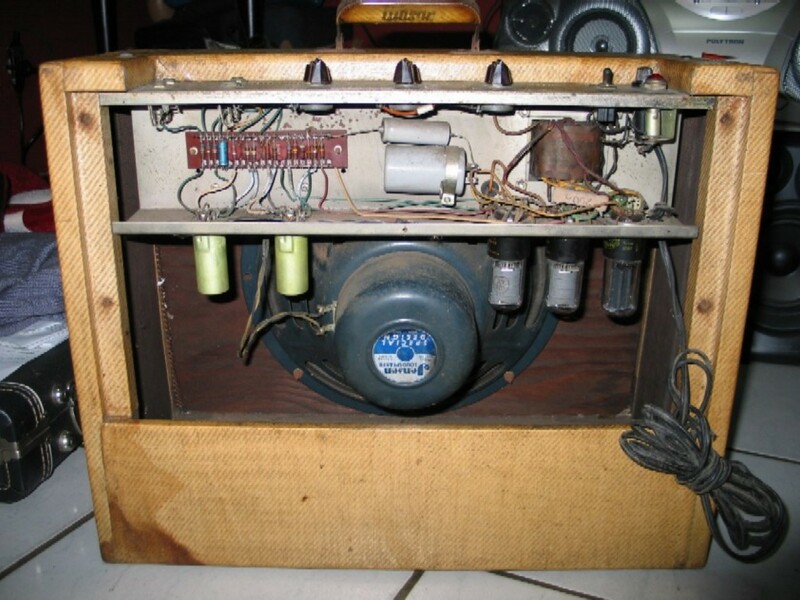 The GA-5 tube compliment during this period was: 1x6EU7 (pre amp), 1x6C4 (phase inverter), 2x6AQ5s (in a push pull power amp design), 1x6X4 (rectifier). 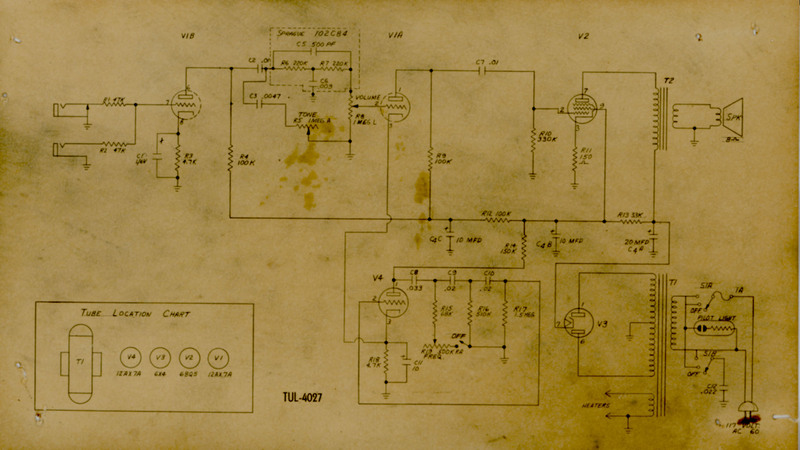 With this design, the tubes were mounted horizontally on the back of the chassis (top of tubes pointed to rear). Approx. size is 20.25" x 15" x 6.5". 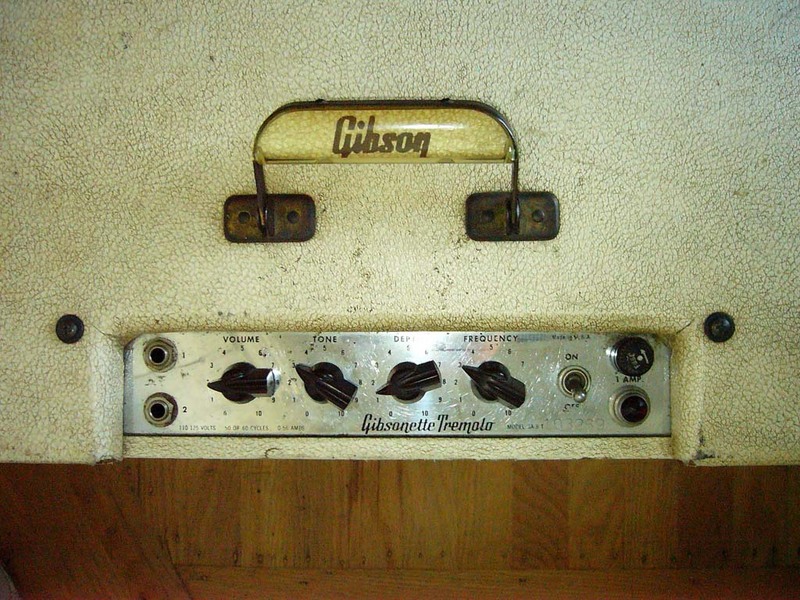 The GA-5T is a push-pull 6AQ5 amp with a 10" so-called Gibson Ultrasonic speaker. 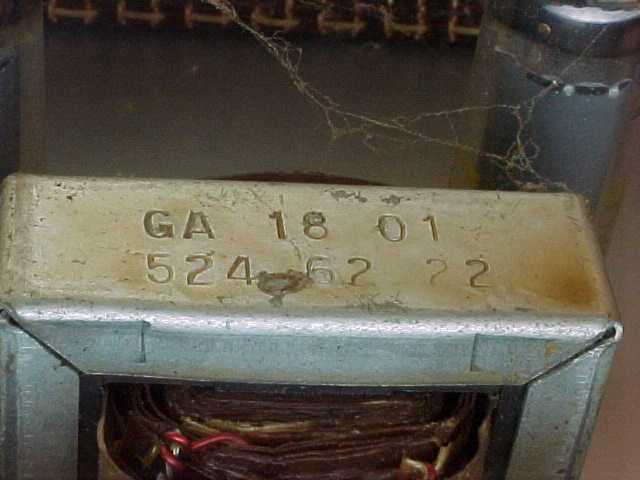 A 6X4 is the rectifier. 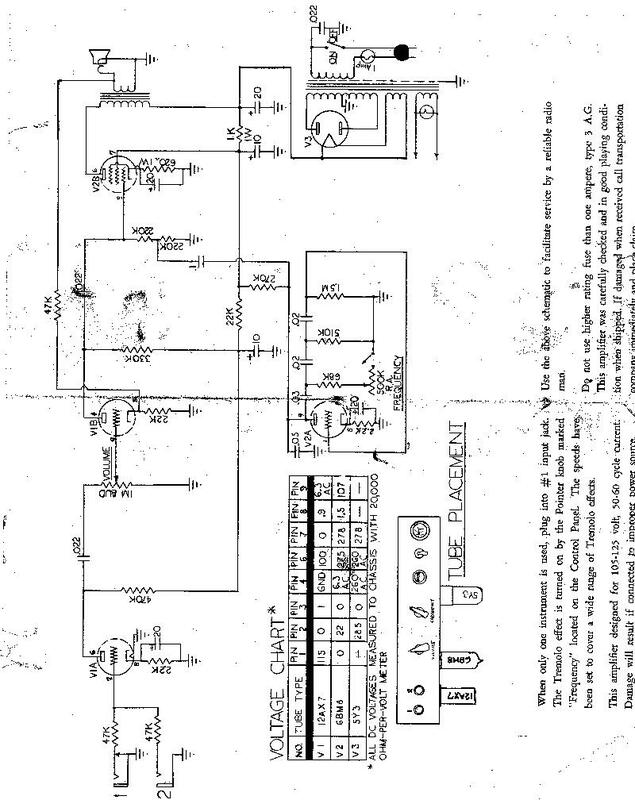 It uses 2 6EU7 tubes: 2 halfs for the preamp, 1 half for the tremelo oscillator, and 1 half for the phase splitter. 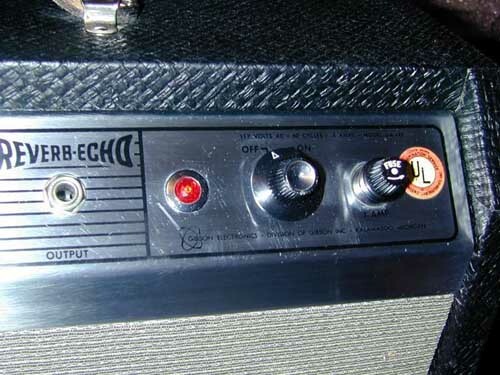 It has a tremolo frequency control, no depth control, and a volume control that I believe serves as the power switch as well (I don't remember). In 1962-? 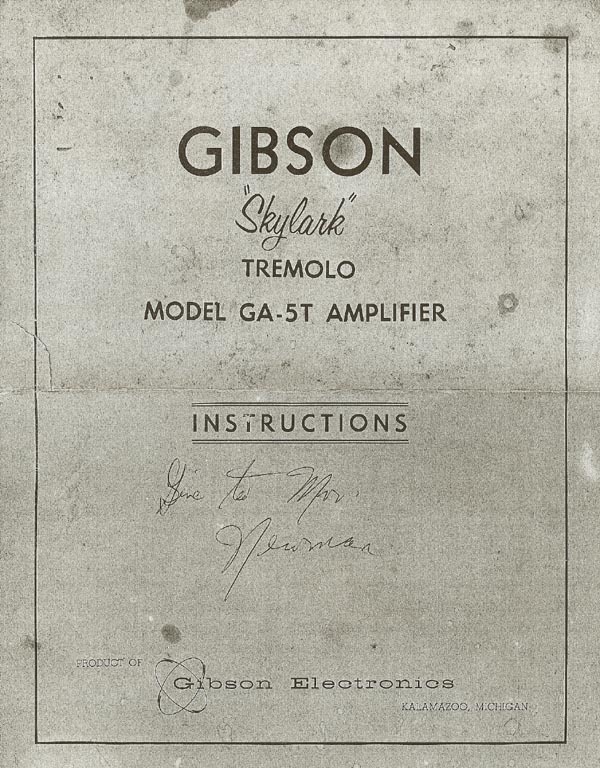 Gibson introduced the 'Crestline' models, and the venerable Skylark got a complete re-design and significant circuit changes, including the addition of a tremolo circuit in the GA-5T. 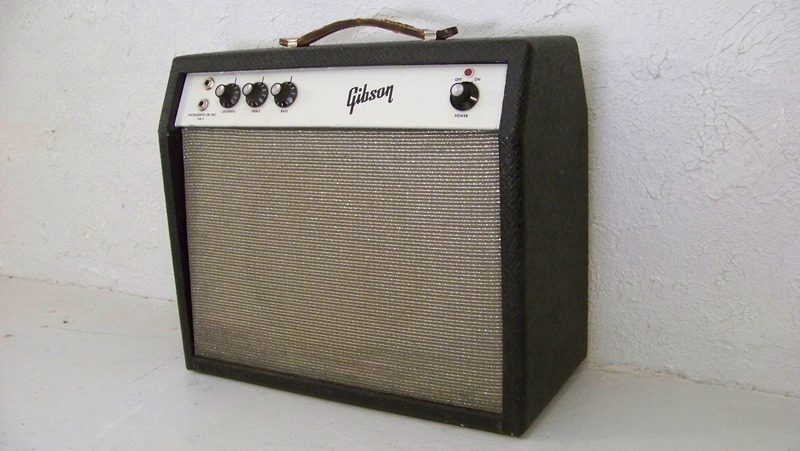 Note the differences between the rough, dark, black 'elephant hide' tolex and silver grill cloth on the GA-5T (see pic), and the very dark brown, wood grain imprint tolex and rectangular patterned brown grill cloth on the GA-5 (see there). Whether these differences were specific by model (GA-5/GA-5T) or a mid model/year update is an unanswered question. 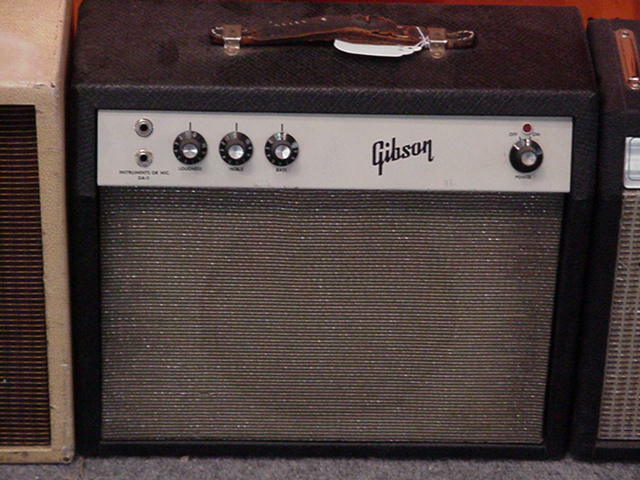 In 1965 and 1966 Gibson gave the Skylark another major design overhaul. 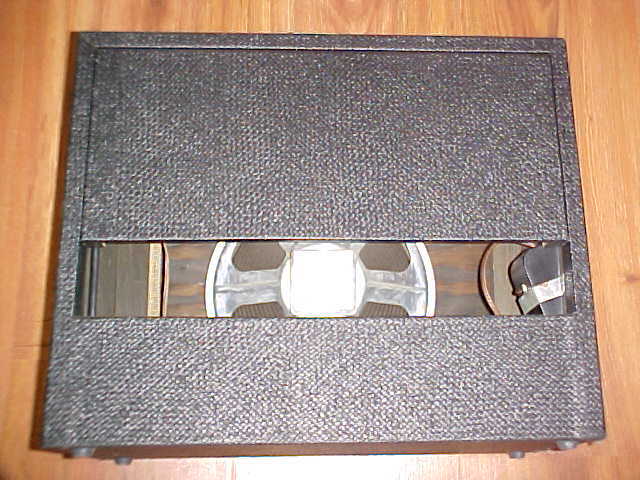 These are commonly referred to as "white panel" amps. 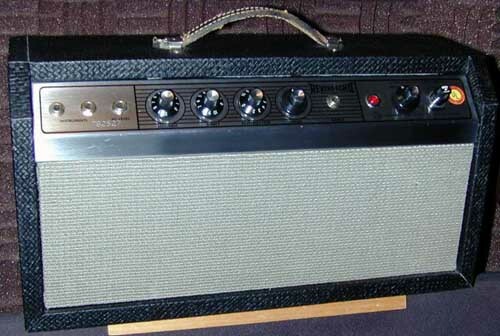 These are notable for their rough black 'elephant hide' tolex, silver grill cloth, and Fender style 1-10 marked knobs (see pic). 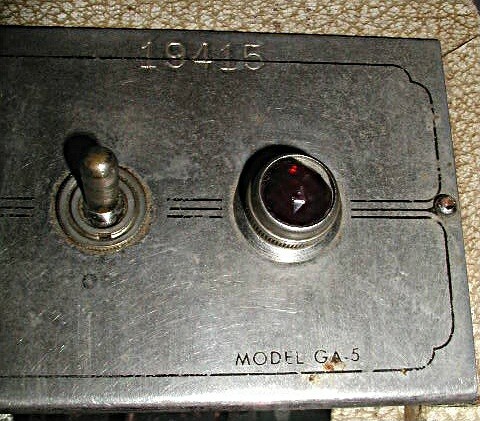 Control panel layout is: 2 inputs, volume, treble, bass, speed and frequency (tremolo), and a rotating on/off knob with a small pilot light above it (the fuse holder is on the back panel). 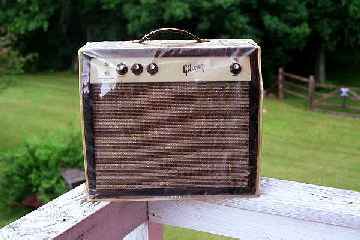 I recently purchased a GA-5 Skylark (White Panel) from Ebay expecting to find a single ended 5 watt. When I opened it up it turned out to be a Push - Pull with different tubes then are mentioned above. 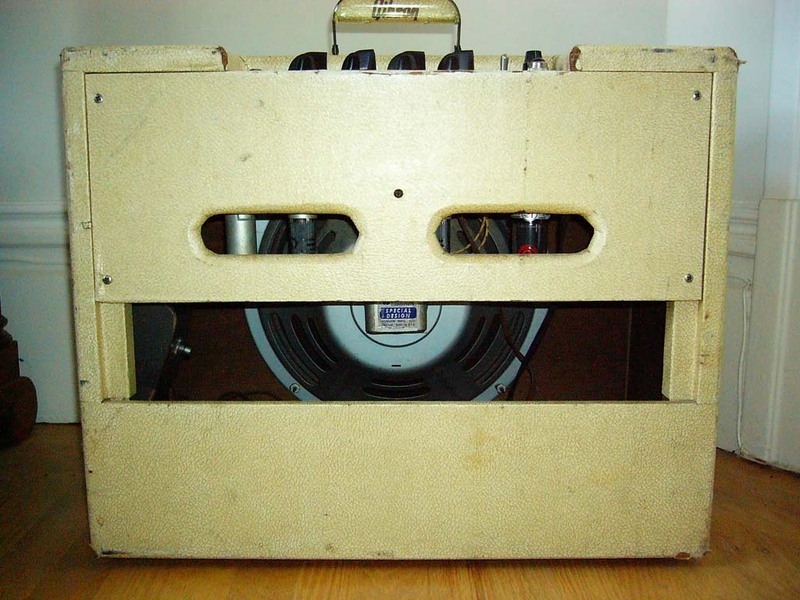 The amp matches the picture on you[r] site exactly. Internally it is much more like the 'GA-5T Skylark (White Panel)' [without] the tremelo. 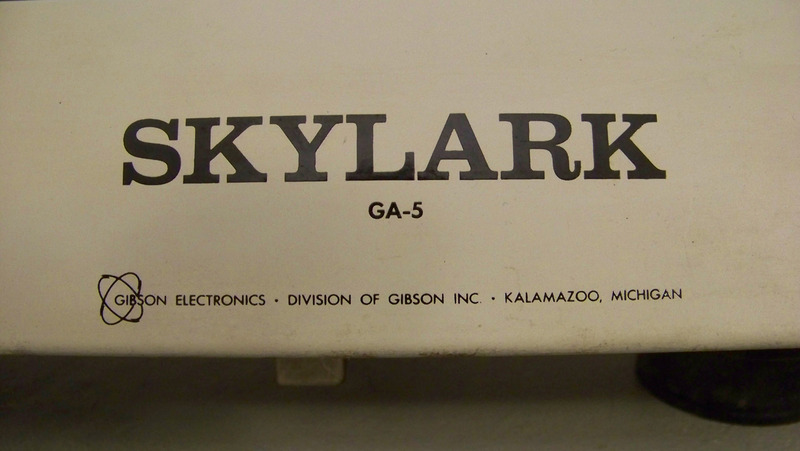 I have been unable to find a schematic to match the 'GA-5 Skylark (White Panel)' I purchased, but I did find the 'GA-5T Skylark (White Panel)'. 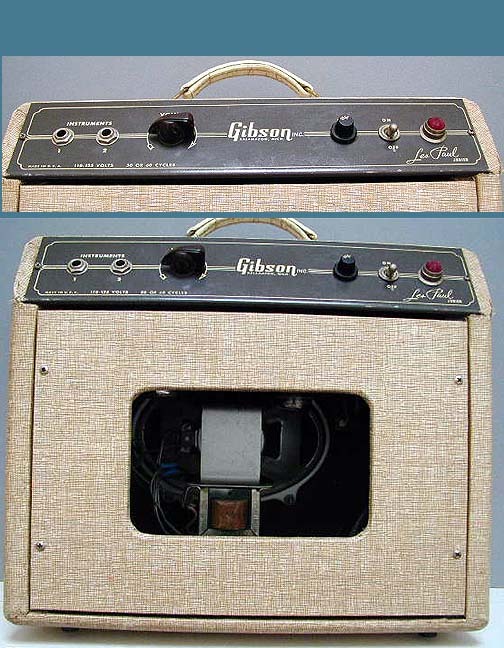 In 1965 and 1966 Gibson gave the Skylark another major design overhaul. 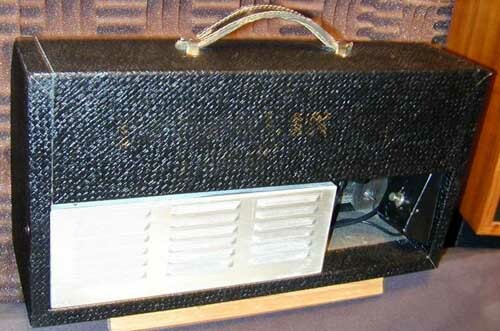 These are commonly referred to as "white panel" amps. 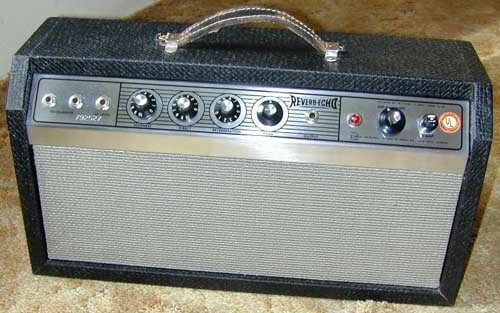 These are notable for their rough black 'elephant hide' tolex, silver grill cloth, and Fender style 1-10 marked knobs (see first pic). 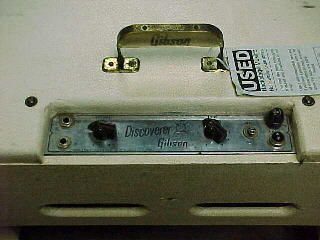 These featured a 10" Gibson Ultrasonic speaker. 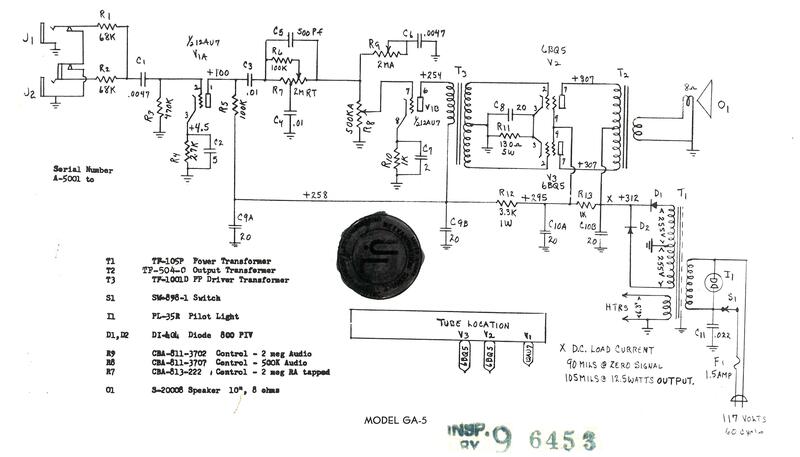 [...] The GA-5T used: 1x6EU7 (pre amp), 1x6C4 (phase inverter), 2x6BQ5 (in a push-pull power amp design), solid state rectification via 2 diodes. In 1967-? Gibson changed the design again to the Medalist? series styling? (see pic). 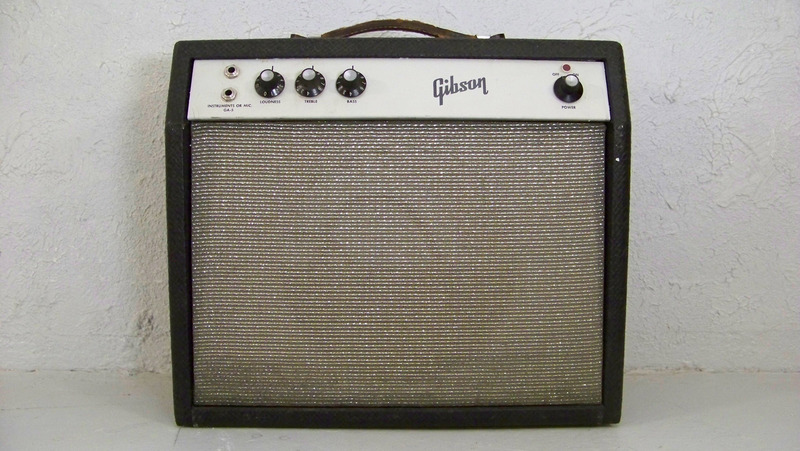 These have the 10" Gibson Ultrasonic speaker and a tube compliment of: 2x12ax7s (pre amp and tremolo), 1x6BQ5 (power amp), 1x6X4 (rectifier). 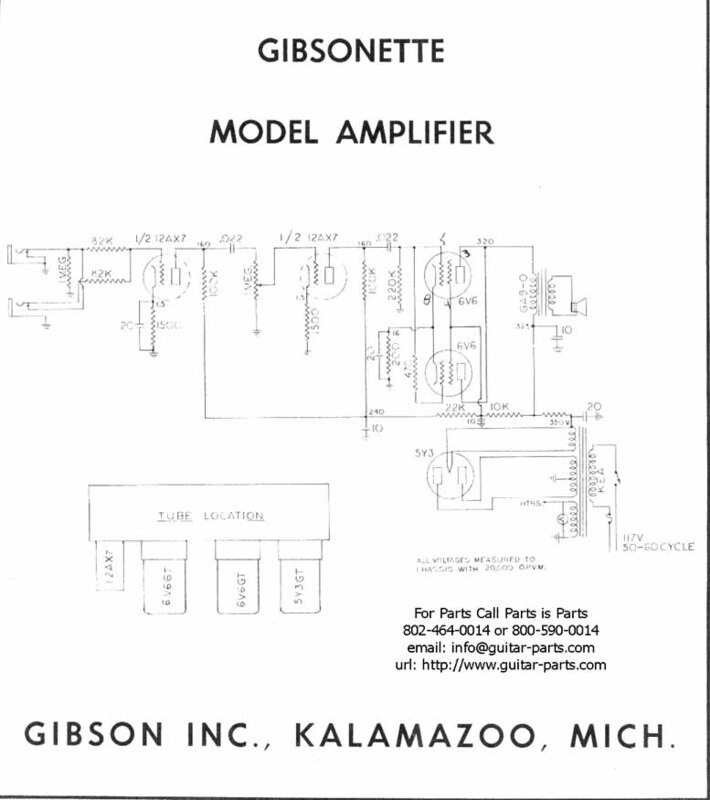 For info on and pics of the Gibson GA-6 Interim Model see Miles O'Neal's web-site. 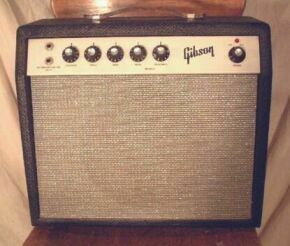 4W 1x10" Guitar Combo (slightly different graphics on control panel, circuitry otherwise identical to GA-5 Les Paul Junior. 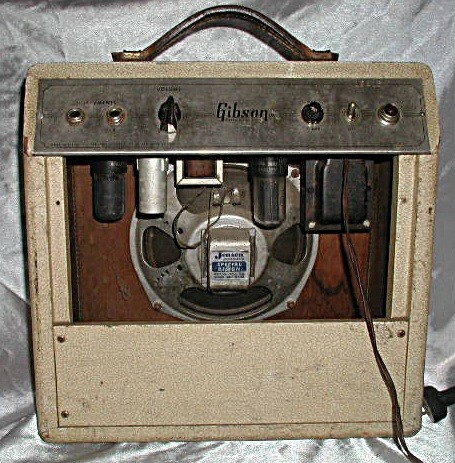 Before the Skylark, one of Gibson's small amplifier offerings was the Gibsonette. 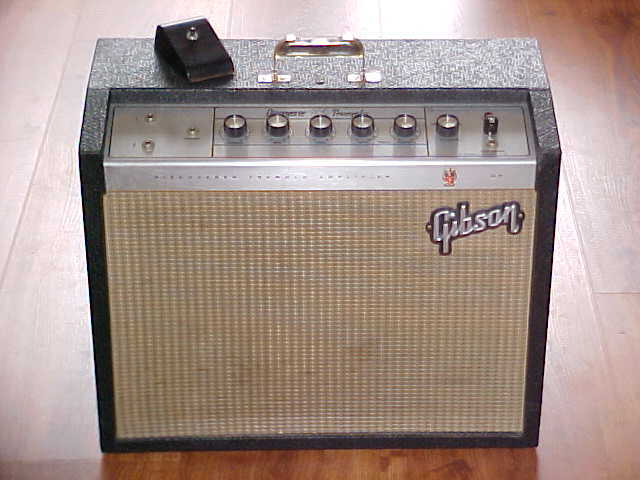 They also were produced in several styles over the years (including different styles, see GA-5 Les Paul Junior and GA-5 Skylark (two-tone)). 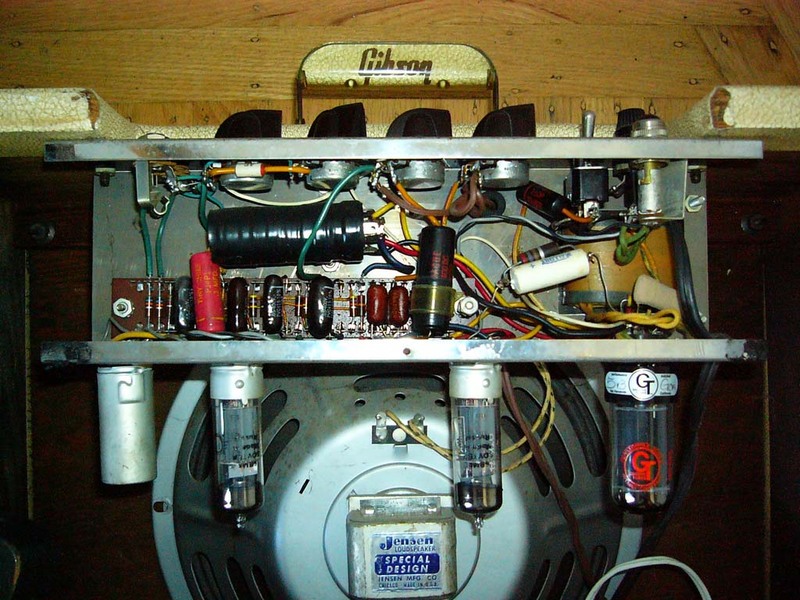 The earliest version of the Gibsonette (1952-53) was not a single-ended amp. While it looks as though the two 6V6s are parallel, they are actually being run push-pull in what is called a "self-split" or "self-balancing" configuration. 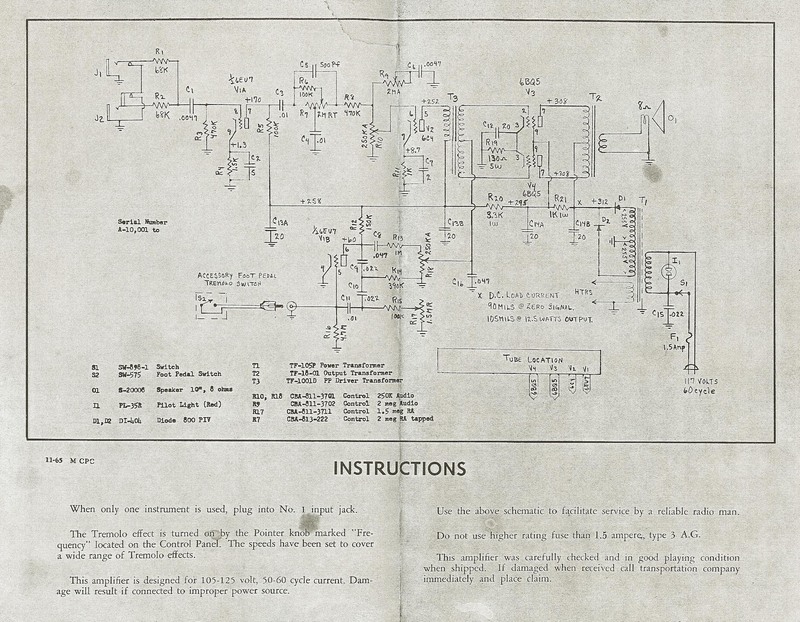 Basically, the signal is fed from one tube to the other, without the use of a phase splitter (which is why it appears to be single-ended). The design was only used briefly because, while it saved the company money, it was terribly inefficient. 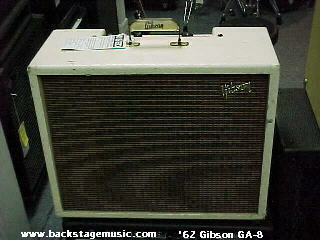 Gibson Garage, Copyright © 2003-10 Dace. 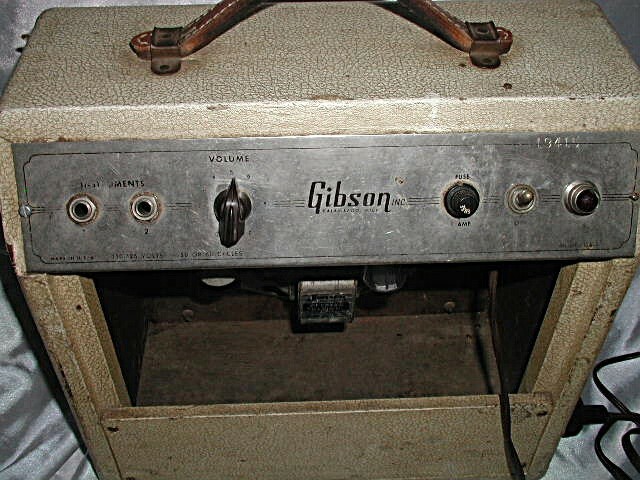 This is no official Gibson site, and I am not affiliated with the company in any way. Disclaimer.